Thanks for a Great 2012! In essence Insightly boils down to bringing business communication, CRM, and project management together into one applications - topped with search across all three. We're trying to un-complicate business software by removing the need to context switch between these applications, while wrapping it all up in a slick web interface that's both fast and simple to use. The good news is that as much as we have grown, we still remain true to our vision. Largely based on your suggestions, we believe we have delivered a useful (and fun!) application that helps you manage your business and your customers more efficiently and effectively. In 2013 we will continue to deliver -- so look for reporting, our android app and other surprises early in the year. Keep those cards and letters coming as we love to hear how our you are using our product. And (admittedly shameless plug) don't forget to like our new Facebook page! Any changes to information in the iOS application are reflected in real time in the web version of Insightly, ensuring up to date and accurate information for everyone. Try it and let us know what you think -- all feedback helps us improve. We have new video testimonials from Centercode and Warwick Mills. In addition, Acumen Learning reports saving $10,000 since using Insightly. 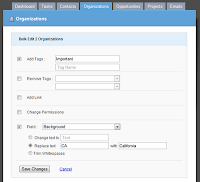 ShuttleCloud leverages our integrated CRM and project management functionality. Summit Security is using us in their customer service group. All proving that Insightly offers tangible value for small businesses everywhere. Want to share your Insightly story? Drop us a line at email@insight.ly! No limit to the size of saved notes and comments (previously was 4000 characters max). We've added a rich text editor to notes, comments and task details so you can add bold, italics, and underlined text, and bulleted and numbered lists. 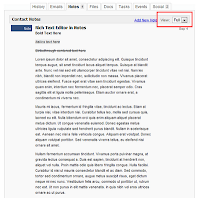 You can now also paste in HTML from web pages and preserve formatting too. We've also added a new field so you can set the date of the note, which helps when you are entering notes about events that occurred in the past, and you wish to preserve the chronological order in Insightly. We also added a new view for the display of notes in Insightly that shows the full contents of each note and any comments associated with them in the list, saving you from having to click through to individual notes to read them. And the final improvement to notes and comments is the removal of the 4000 character limit, so you can type or paste in huge notes and have them saved and searchable immediately. When you create a custom filter under contacts, organizations, opportunities or projects - you now have the option to share that filter with other users in your Insightly. All other users will be able to see and apply the filter, but only you or administrators will be bale to delete the filter. 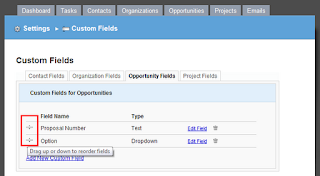 Administrators of Insightly can now change the order in which custom fields appear in both add and edit forms. 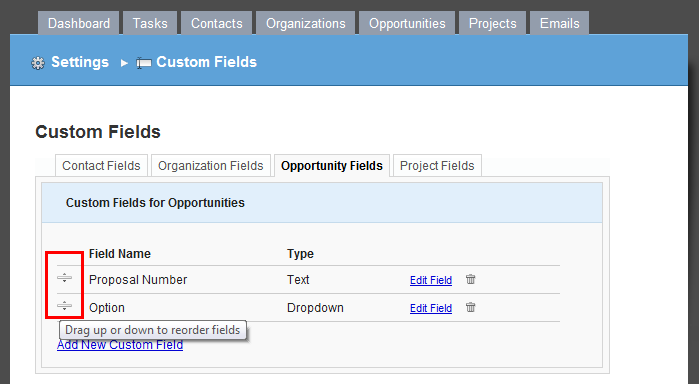 You can drag and drop fields to change the order using the handles to the left of the field name as shown below in red. When we introduced social profiles to contacts in Insightly in June they were a big success, with over 60,000 social profiles being linked to contacts to date. We also had quite a few requests for the ability to add Twitter profiles for organizations too, so we've included that feature in the latest updates, as shown below. 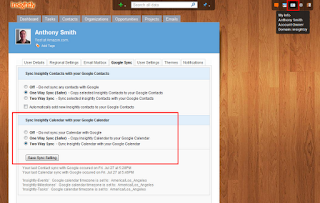 We've had the ability to link Google Docs to contacts, organizations, opportunities and projects in Insightly for a long time. We now include the ability to link a Google Doc or Google Drive folder to any one of these items too - so if you keep all your docs related to a specific client in one folder, you can choose to link the whole folder to the organization in Insightly. One oft requested feature is the ability to send emails from your email client to Insightly, and have them automatically attach to a specific opportunity or project. You can now do this via a special email address we've crafted for each user and each opportunity and project. Sending an email to that email address will automatically link it to you, the specific opportunity or project, and to other contacts addressed in the email. You can see your special email address under each opportunity and project in the 'Link Email Address' field, as shown below in red. We've greatly enhanced activity sets in Insightly in this release. Activity Sets are templates for a group of tasks or events that can be applied to contacts, organizations, opportunities or projects in Insightly to automate processes within your business. You can also attach activity sets to individual stages in a pipeline too. 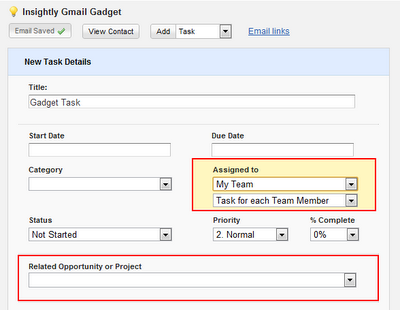 You can now assign tasks in an activity set to a team of users, and any member of that team can complete the task. Activity Sets are not just for tasks anymore. You can now add events to an activity set, and choose to set the start date for an event a number of days after the start date or before the end date of an activity set. We now let you choose the start date for an activity set when you apply it. So if you want the tasks in an activity set to start in two weeks but you want to apply the activity set to a project now (say you're adding the project to Insightly now) you can now choose the start date for the activity set and all tasks in the set will be staggered from that start date. We're now also allowing you to set the due date for tasks a number of days before a specific end date for an activity set too (sometimes called reverse activity sets). A good way to illustrate the usefulness of this feature is with an example. Say you're a hotshot lawyer and you have an upcoming court case in three months, and you know that you need to have the briefing completed five business days before you're due in court, and the client deposition preparation all done three days before the big court date. 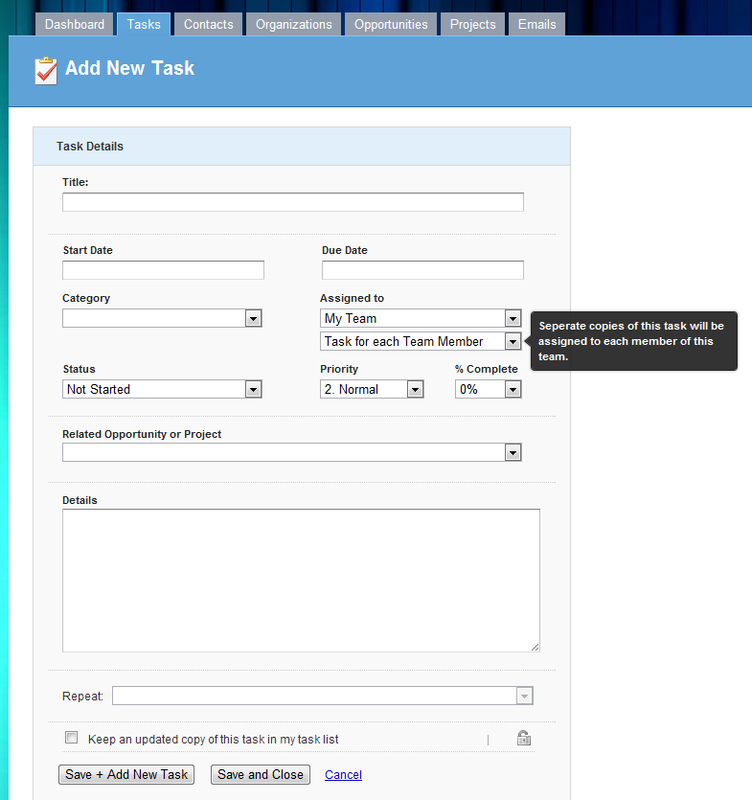 You can setup an activity set with a task due 5 days before the end date, and another task due 3 days before the end date. Then you can add that activity set to your court case project and set the end date for the activity set to your court appearance date, and Insightly will take care of the rest with the tasks being automatically created and due the correct number of days before your big debut in court. 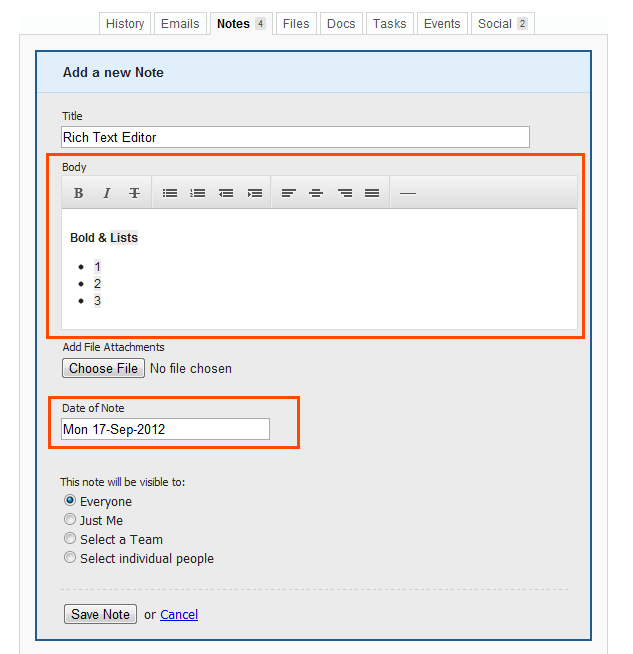 Our last big feature in this release is a new bulk editing tool for contacts and organizations. We've consolidated and simplified some of the editing features onto one page, and included a few new capabilities to make working with multiple records at once much easier. 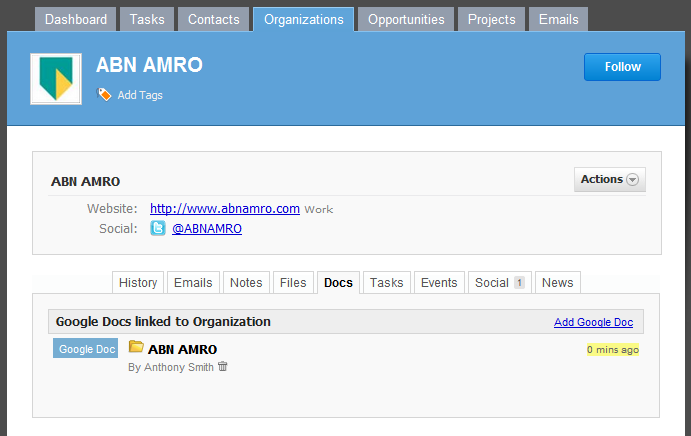 You can now add tags, remove tags, add links or change the permissions on a number of highlighted items more easily. We're now also including the ability to change or find and replace the text of almost any field in a group of selected items too. 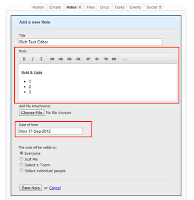 To use the new bulk edit system first highlight a number of record that you wish to work with. 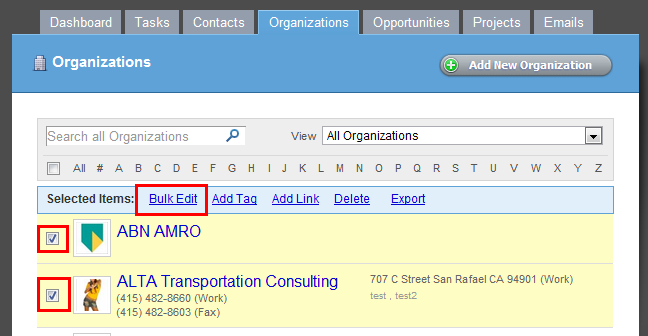 Then just click the 'Bulk Edit' link that appears in the top of the list to go to the bulk edit screen. Finally made the changes you wish, then when you click the 'Save Changes' button, those changes will be applied to all the items you first highlighted. If you have any questions about these features or any others in Insightly, email our friendly support team at support@insight.ly. For users on our paid plans, today we're introducing our REST based web Application Programmer Interface (API) that allows you to automate data retrieval and modification in Insightly. We support JSON and XML based requests, and most of the data stored in Insightly can be accessed and updated via the API. As far as HTTP REST API's go, ours is pretty conventional and you should be able to pick it up pretty quickly if you've used one before. We support four HTTP verbs - GET requests to retrieve information, POST to add new records, PUT to update records, and DELETE requests to remove records. To get an indication of the fields returned for any record type, the easiest way is just to perform a GET request of the top level items to get a list of objects back (see below). 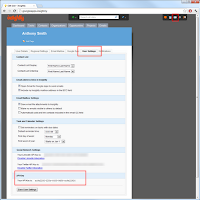 Insightly uses HTTP Basic authentication in order to determine which user is making calls to the API. You'll need an API key for each user to uniquely identify them making calls to the API, and this can be found by logging into Insightly and going to the 'My Info' page, then the User Settings tab. The 'My Info' page can be accessed via the small card icon in the top right corner. You'll need to include your API key as the user name (Base64 encoded), and you can leave the password blank or put in whatever password you like - Insightly will ignore it. All the calls you make to the API will be as this user, and permissions to view, edit and delete records via the API will be the same as those available to that user through the Insightly website. The Insightly API requires all calls be made via HTTPS, and we support both GZIP and DEFLATE compression to reduce the payload size of data sent back to the client. Just add an 'Accept-Encoding' header to your calls to indicate your support for returning compressed responses. If no content-type header is included in your call, we return JSON data by default. If you include a header of "content-type: text/xml" we will accept and return an XML representation of the data. If a request is to return over 10,000 records, only the parent objects will be returned in the result and any child objects (eg: addresses, phone numbers, links etc) will be omitted to reduce response sizes. This is mostly applicable to large contact lists, organization lists, or task lists. To retrieve the child objects, request each individual record from the server by ID, or use a querystring of $top to limit records returned (see below). If you have any feedback or questions about the API, please send an email to support@insight.ly and we'll put you in touch with one of our developers. Thanks. 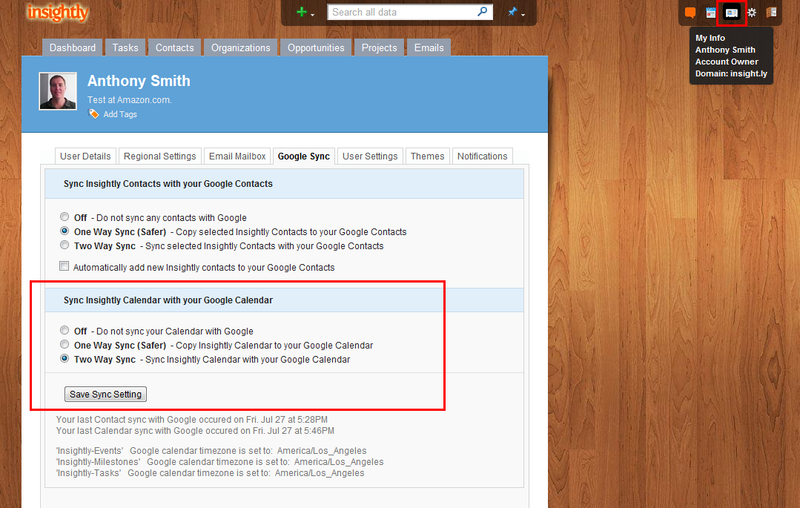 For users on our paid plans, as a compliment to our Google Contacts Sync, Insightly can now sync your Insightly events, tasks, and milestones into your Google Apps Calendar. When turned on, Insightly adds three new calendars into your Google Calendar for Insightly events, tasks and milestones - so you can easily turn off any of those three calendars if you don't want to see those items. 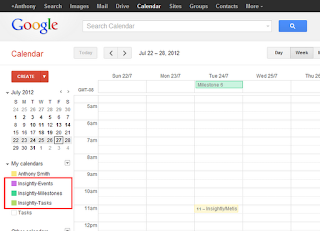 The Insightly Calendar Sync does not allow your personal events on your Google Calendar to appear within your Insightly Calendar - the events must originate within Insightly first. The calendar sync will run approx. every 10 minutes, so any tasks, events, or milestones added to your Insightly calendar should appear on your Google Calendar shortly thereafter. We support two flavors of sync for the calendar - either one way sync, in which a read-only version of your Insightly events, milestones and tasks are copied over to your Google Calendar - or two way sync in which items copied over to Google can be edited right in your Google Calendar, and those changes will be saved back to Insightly automatically. If you are unsure of which type to select, you should choose one way sync so you don't inadvertently make changes within Google Calendar. Your Insightly administrator has to first enable Google Sync for selected users. This can be done by checking the checkbox labelled 'Google Sync Enabled' for each user under Settings > Users, which can be access via the small silver gear icon in top top right corner (as shown below in Red). Once sync has been enabled for you, you can choose which sync type you want from the 'My Info' page, which is the small card icon in the top right corner (as shown below in red). You can choose to have one way sync enabled, in which your Insightly tasks, milestones, and events will be copied to your Google Calendar, but changes made there will not be kept - or two way sync where any changes made on your Google Calendar will be copied back to your Insightly Calendar. 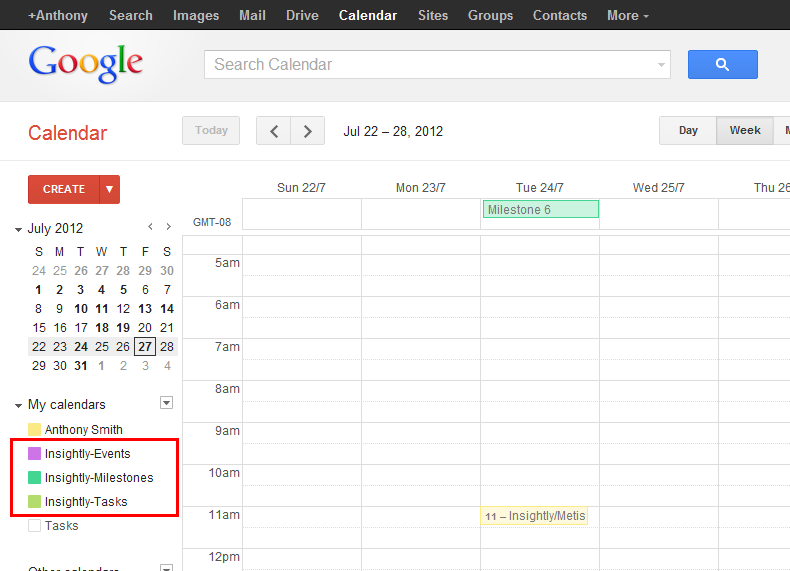 Below is a screenshot of Google Calendar with the three sync'ed calendars from Insightly highlighted in red. We've just launched some great new improvements to our beloved Insightly Gmail Gadget to make it easier to use, and to add new functionality. We've concentrated on being able to do more right in the gadget itself without having to jump out to Insightly. In the previous version of the gadget, when you saved an email to Insightly we would automatically save and link the contact associated with that email, but you could not add the contact to Insightly independently without saving the email first. In this new version, you can choose to add just the contact without saving the email first, and you can also edit the new contact's details right in the gadget after saving, so you can add additional details like phone numbers and addresses. If the contact is already in Insightly, you can choose to view and edit their details. 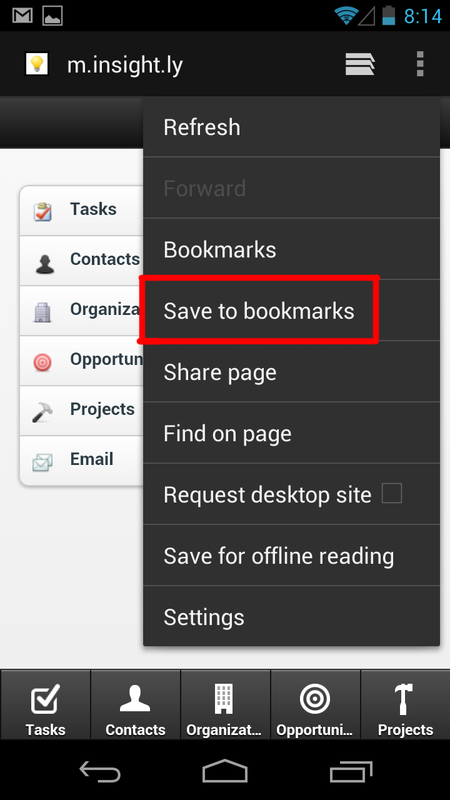 We always had the ability to add links to an email after saving it, but most users were not aware of this feature because it required an extra action after saving the email. In this new version of the gadget, after saving an email to Insightly we now show you an editable list of links to the email, and we conveniently suggest opportunities and projects that this email might relate to - giving you the power to add those suggested links with just one click. 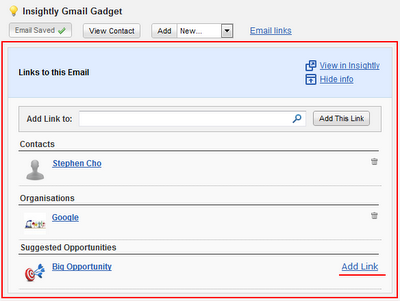 You can also search for additional items to link the email to, and add those links right in the gadget. For the suggested links feature, we look to see which active opportunities and projects the contact is already linked to and we show those, as they are a likely indicator of what this new email relates to. 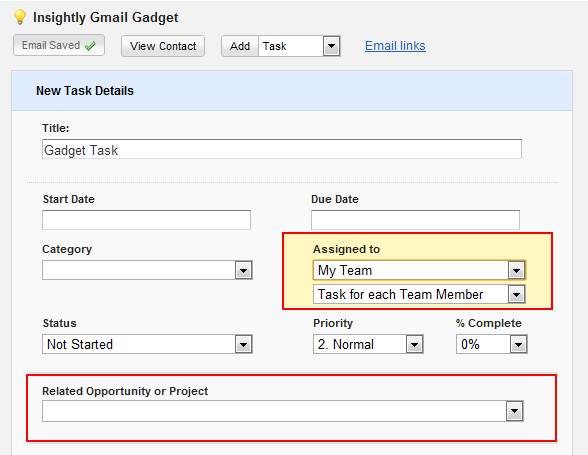 You can now add events to Insightly from within the gadget, along with tasks, opportunities and projects. And if you save the email before creating a task, opportunity, or project - Insightly will link the saved email to that new item for you automatically too. 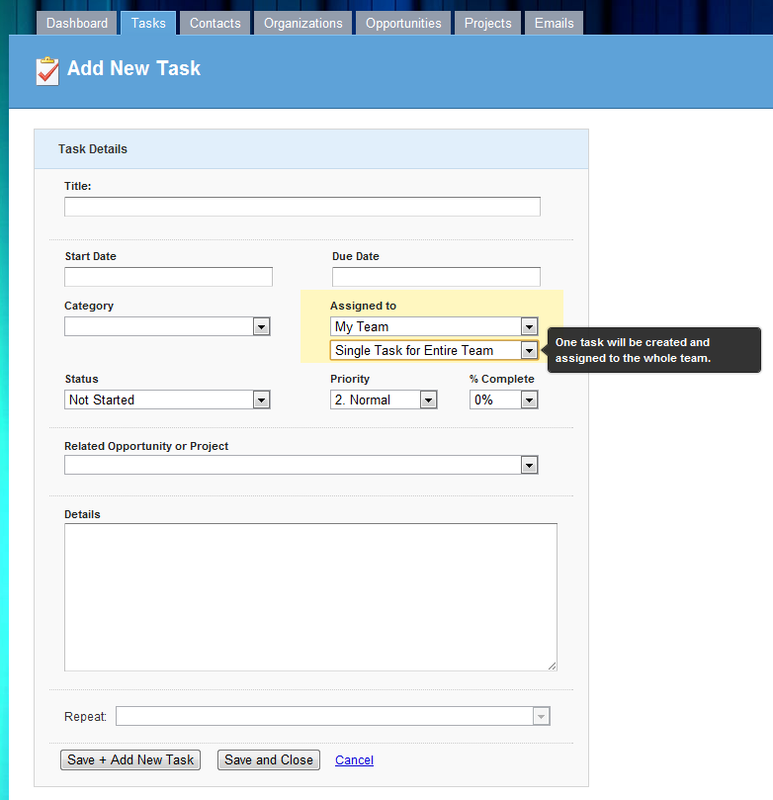 We've added additional functionality when creating a new task using the gadget, and we now allow you to assign the task to an opportunity or project, and to choose the appropriate milestone or pipeline stage to which the new task belongs if applicable. 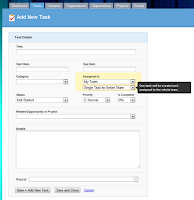 We also added the option to assign a new task to a team of users, instead of just one individual user. We hope you like these new improvements ! 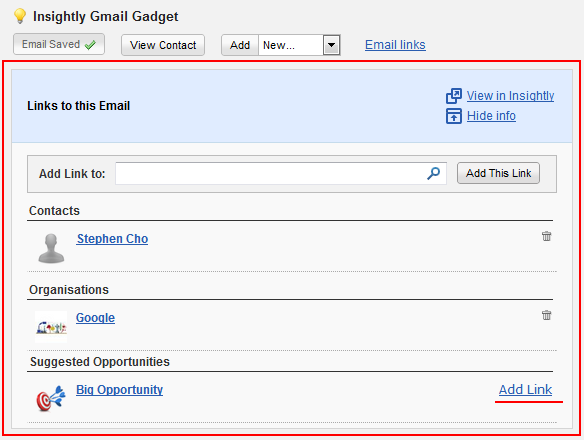 If you cannot see the new version of the gadget within your corporate Google Apps Gmail, log out and then log back into Gmail and you should see the new version. We have just made three improvements to the Insightly mobile web application, which you can use by navigating to http://m.insight.ly in the browser of any Android phone, iPhone, iPad, or Blackberry Torch. 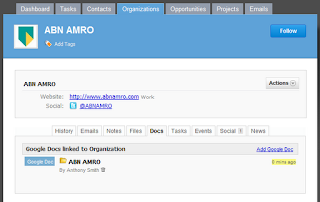 We have added the ability to search your contact and organization lists in real time. A new search box is presented at the top of both the contact and organization list, and as you start typing into the list, we will present the matches to your search in the list below. This makes it much easier to find contacts and access their details quickly. 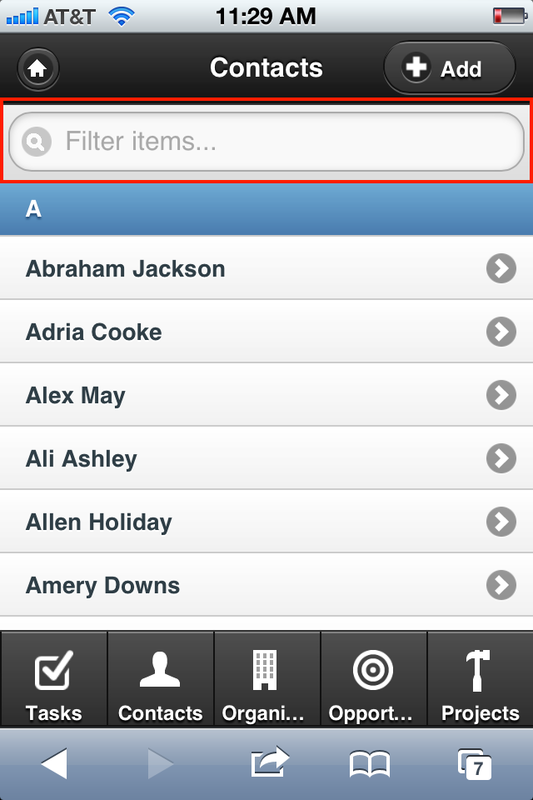 Insightly mobile will now break up long contact and organization lists into pages of fifty records, so pages load faster and the client is more responsive. Get to the next page by clicking the arrow or page number at the bottom of the list as shown below in red. 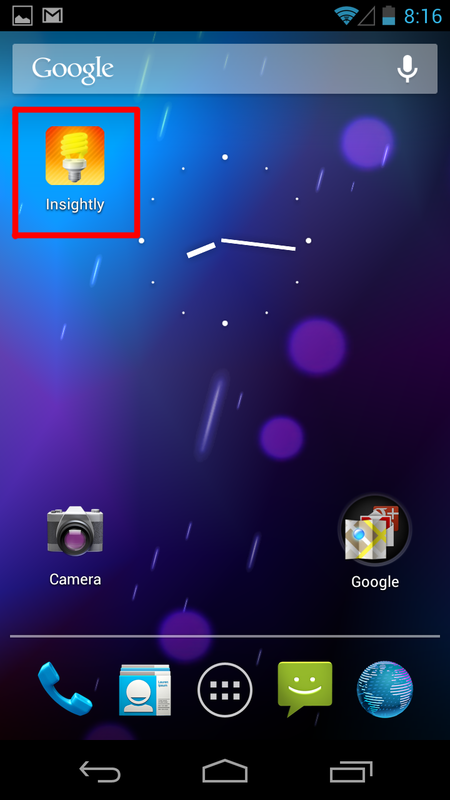 Insightly can be added to the home screen of your Android phone for easy access. 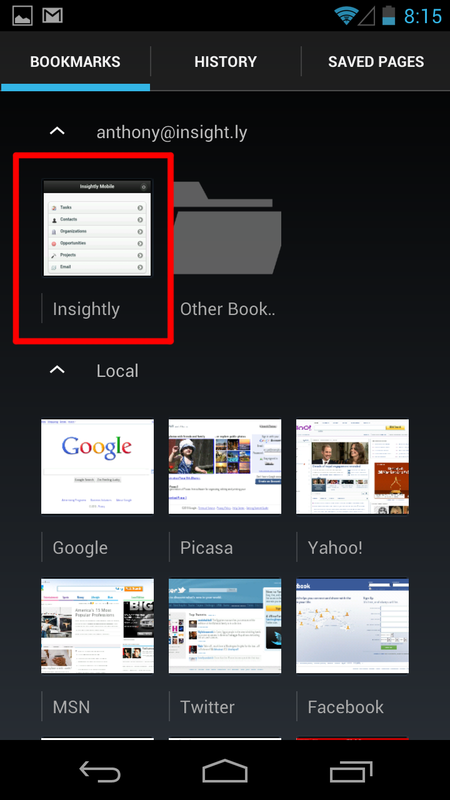 Just navigatoe to Insightly Mobile at http://m.insight.ly and bookmark the page in Browser or Chrome. 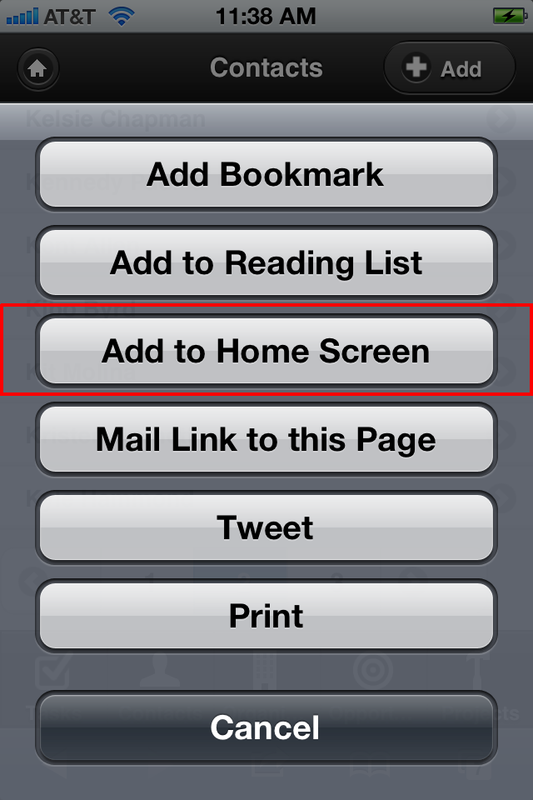 Then open your bookmarks and long tap the Insightly bookmark you just saved, and choose the 'Add To Home' option to add Insightly to your home screen. 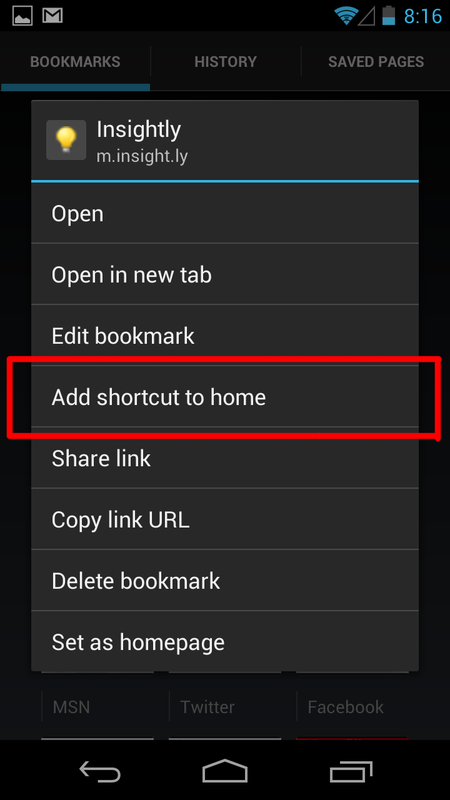 Screenshots are shown below for Android 4.1 (Jelly Bean) but other versions are very similar. Insightly can now be added to the home screen of your iPhone or iPad, and when it loads the browser toolbars will be shown, so you have more screen area to use Insightly. Just tap the shortcut icon in the center of the bottom toolbar in Safari, and then choose the "Add to Home Screen" option from the popup menu. 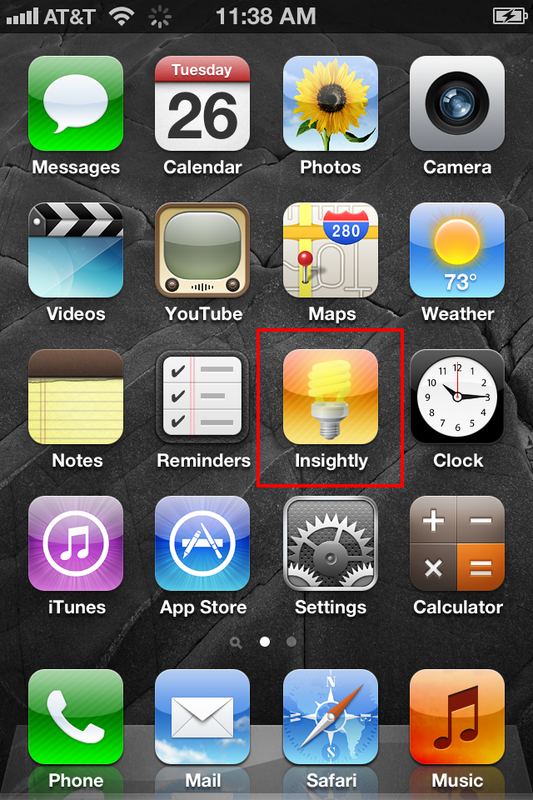 Insightly will be added to your iPhone or iPad home screen for easy access. Note: If you're a Google Apps Paid Business customer and receive an Secure Sign On (SSO) error message when logging into the Mobile app, you will need to enable Federated Login in order to use our mobile app. From Google Apps, click "Manage this domain". In the blue bar, click on "Advanced tools". Under "Authentication", click "Federated Login using OpenID"
Make sure the checkbox labelled "Allow users to sign in to third party websites using OpenID" is checked. Along with the three major features we just added to Insightly (in blog posts below), we have added a small additional feature to the Tasks section of Insightly that has been requested a few times. 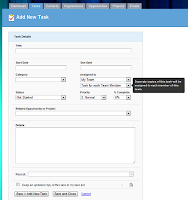 In Insightly you always had the ability to assign a task to a team, and a copy of that task would be assigned to each member of the team individually - essentially creating multiple copies of the same task and assigning them to each team member. We still have that option, but we're also adding the ability to assign a single task to the entire team, which will show up in the task list for all team members, and allows any member of the team to complete that task and it will show as completed for all team members. A small enhancement which I'm sure will please those who requested it. We are excited to announce that for users on our paid plans only, Insightly now integrates seamlessly with your MailChimp account. For those of you not familiar with MailChimp, it’s an online newsletter/marketing platform that’s well worth checking out. With the new feature roll-out you are able to Import Contacts to Insightly from your MailChimp account and Export Contacts from Insightly to any of your MailChimp Lists. 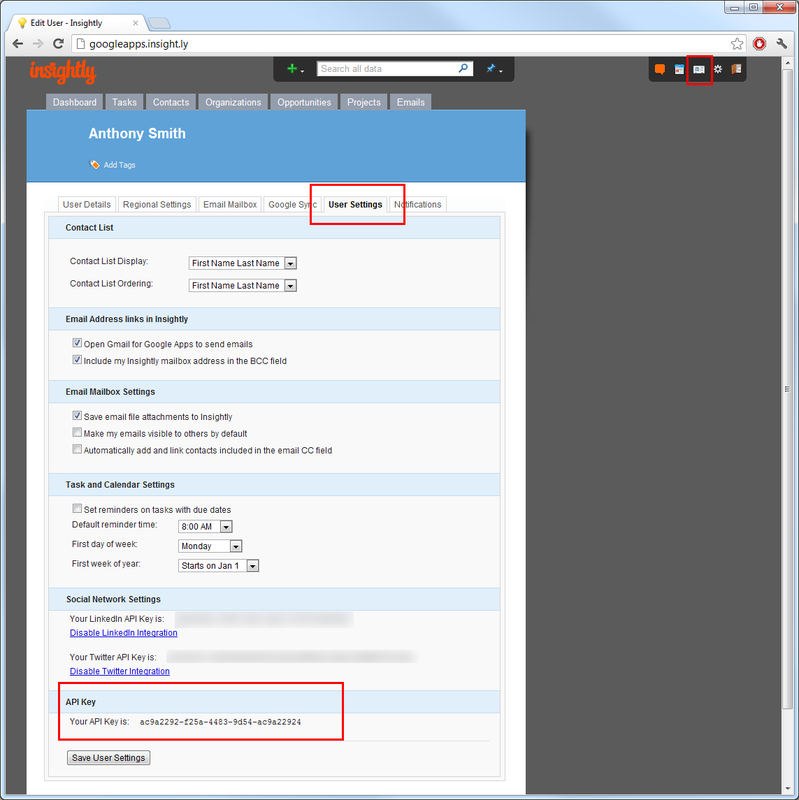 1) Log into Insightly using an Administrator account, navigate to System Settings > MailChimp Integration. The MailChimp Settings window will be shown. 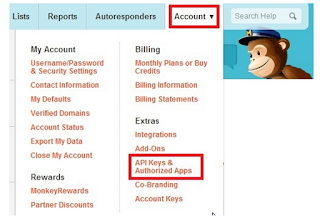 2) In a separate browser window, log into your MailChimp account and navigate to Account > API Keys & Authorized Apps. 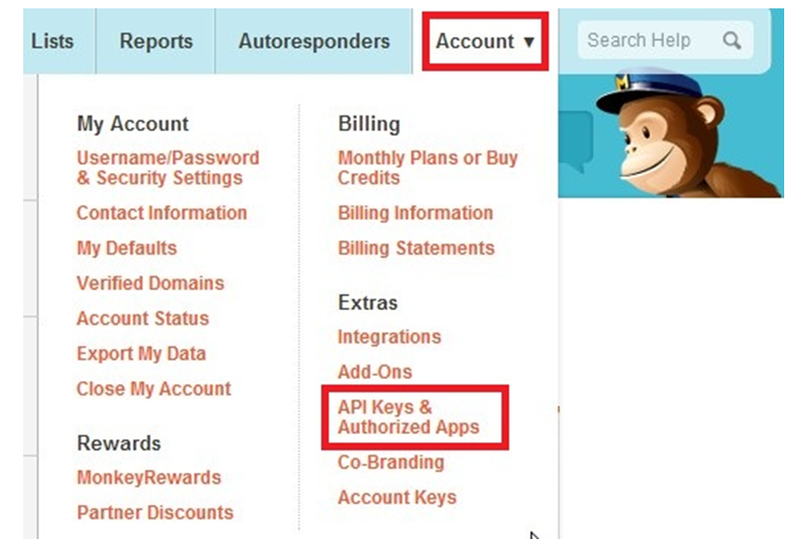 3) If you have an enabled API Key in the “Your API Keys” list, copy the key you wish to use and paste it into the “MailChimp API Key” text box in Insightly. If you do not have an API Key, just press the “Add A Key” button and one will be generated for you. 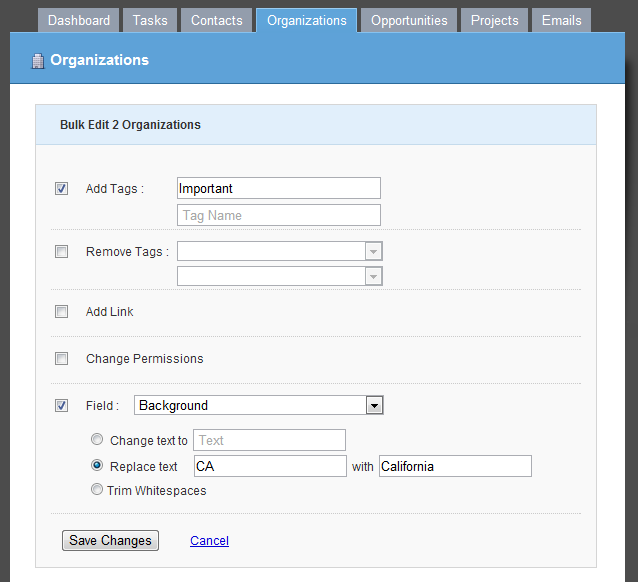 4) Once you have the API Key in Insightly, choose a “Contact Email Option” next. This determines which email address of your Insightly Contacts will be used when you send a Contact to a MailChimp List. The Default option is “First Email Address Listed”. First Email Address Listed means that if the Contact has one or more email addresses, the first address will be chosen regardless whether it is tagged as a “Work”, “Home” or “Other” email address. 5) Press “Save Settings” to complete the setup. 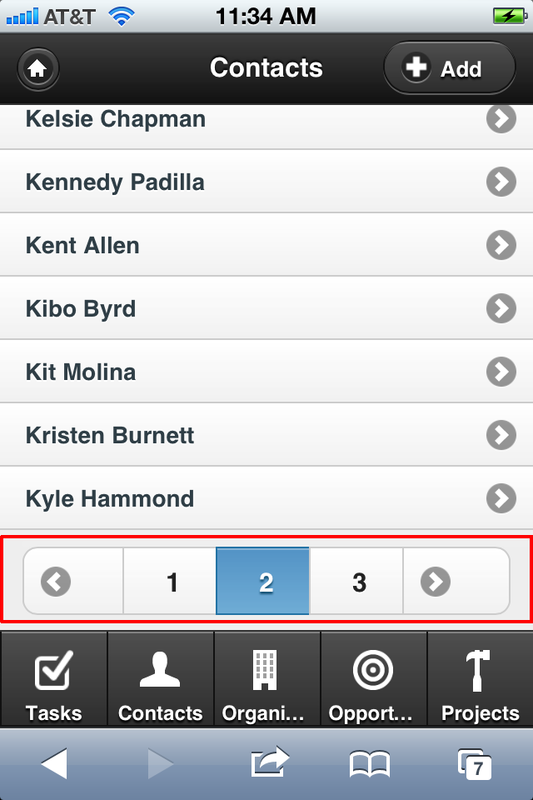 From the Contacts list in Insightly you now have the option to send contacts to a specific mailing list in MailChimp. The procedure is similar to any other bulk action you would be performing on the Contact records. 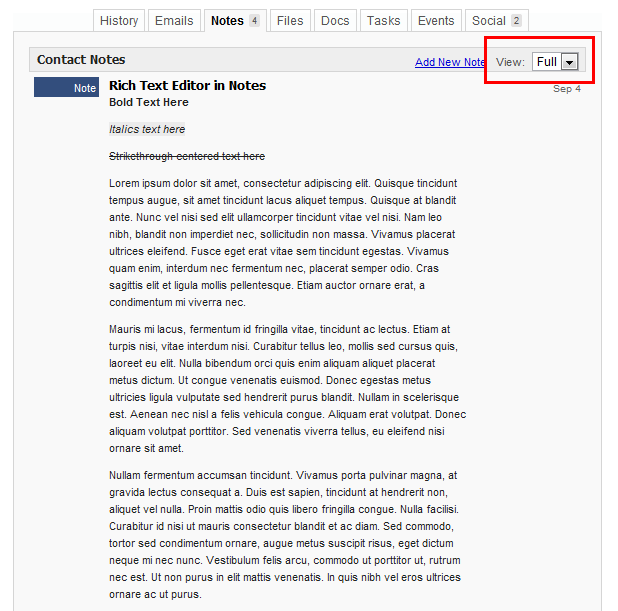 NOTE: You will need to have at least one list defined in MailChimp to send Contacts. If you have not already done so, please set one up before you attempt to send (In Mailchimp, go to Dashboard> Create a List). 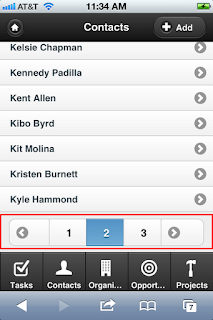 1) In Insightly, navigate to the Contacts tab and select the Contacts you wish to send. 2) Once you have completed your selection, click the “Send to MailChimp” option. 3) A drop down list will appear. From this list, select the MailChimp list you wish to send the selected Contacts to and press “Send to Mailchimp”. The duration of the send procedure will vary based on the number of Contacts you have selected. 4) When the procedure is complete you will see a confirmation message at the top on the page displaying how many Contacts were sent. Contacts sent depends on the email option you have selected in your MailChimp Integration settings. For example, if you selected “Work”, only contacts who have a work email address will be sent. The default option is “First Email Address” which means that if the contact has one or more email addresses, the first one will be chosen when sending to MailChimp. 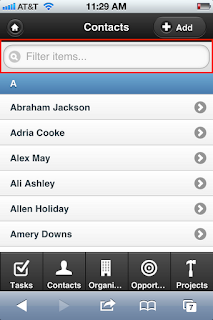 1) Navigate to Contacts in Insightly and click “Import Contacts and Notes” on the right hand side of the screen. 2) Click “Import your Contacts from MailChimp”. 3) From the drop down list that appears, select your MailChimp list you wish to import from and click “Import”. 4) You will be presented with a list of Contacts. Select the ones you wish to import by checking the box next to the Contact. Once you are done with the selection, click “Import Selected Contacts”. The duration of the import procedure will vary based on the number of Contacts you selected, but typically should not take more than a minute or two. 5) Once the import is done you will be redirected back to the Contacts Page and a message at the top of your screen will indicate how many Contacts were imported. 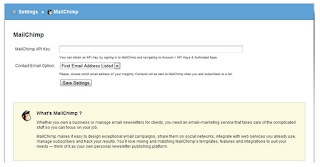 1) Log into Insightly as an Administrator and Navigate to System Settings > MailChimp Integration. 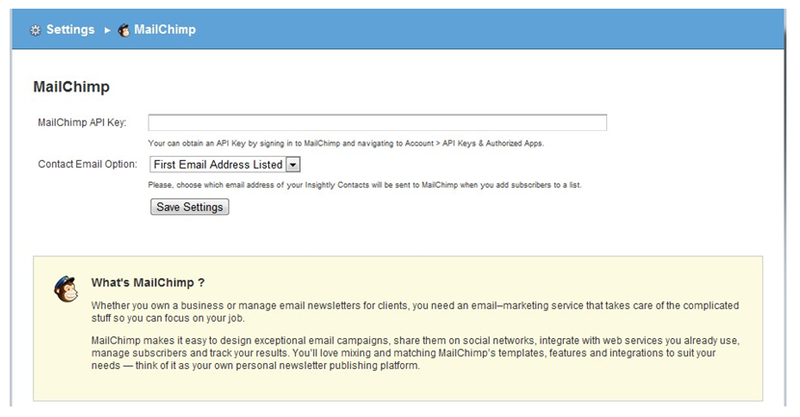 2) Click on “Delete” on the MailChimp API Key line and you’re all done. We are pleased to announce the new Social Integration features in Insightly, designed to help you gather intelligence about your Customers when preparing for the next big sell. You can now import your connected contacts from LinkedIn, as well as link Twitter and LinkedIn profiles to your individual contacts. 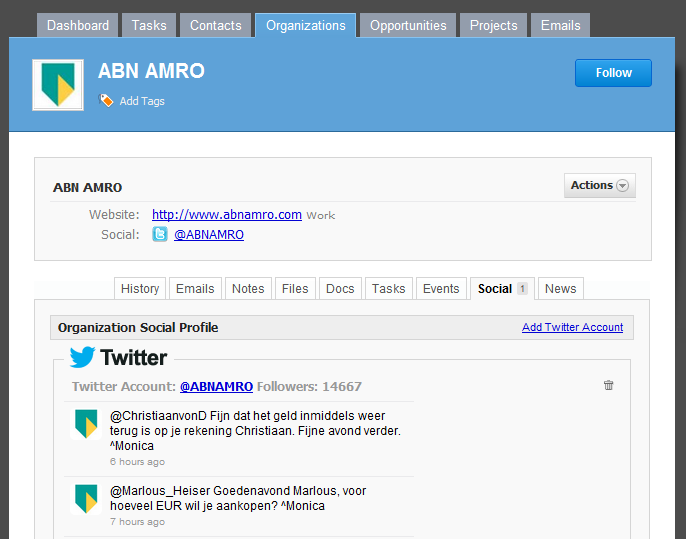 The Social Integration features are accessible under a new tab called “Social” in the Contact Details page. The LinkedIn and Twitter features have to be enabled on a per user basis. This means that if you wish to utilize these features, you will need both a LinkedIn or Twitter account. through the “User Settings” tab in your personal settings. 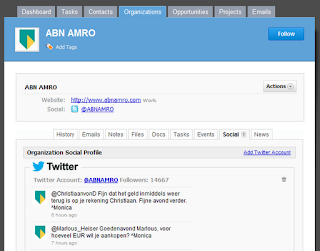 1) Open up any Contact and select the Social tab. 2) You will be presented with two setup links. 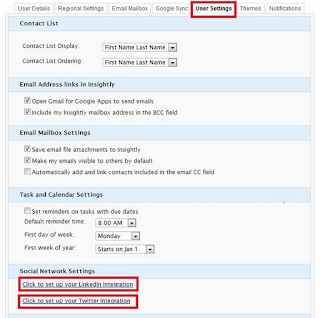 To enable LinkedIn, click “Click here to setup your LinkedIn integration”. 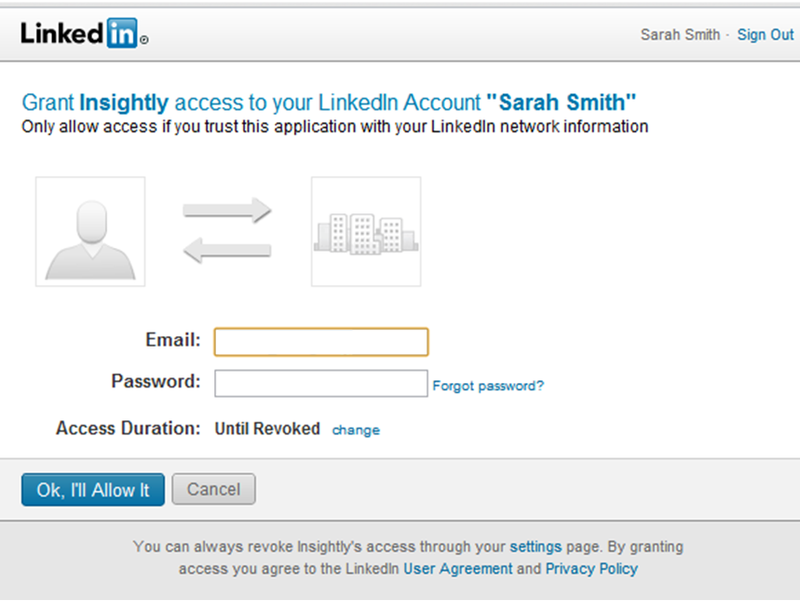 3) You will be redirected to LinkedIn so you can authorize access to your account when you are logged on to Insightly. 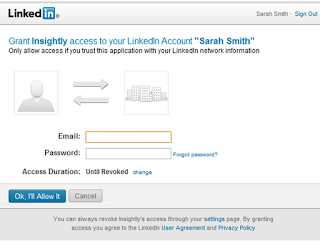 If you are not currently signed in to LinkedIn, you will be presented with a login window first. 4) Click “OK, I’ll Allow It” to accept the authorization, after which you will be redirected back to Insightly. 5) If the authorization was successful you should see the Search option in the LinkedIn area, or the LinkedIn Profile of the Contact if they have already been associated with a Profile. 6) If no LinkedIn profile appears, click “Search”. A default search will be performed and the results will be displayed below the LinkedIn box. Click “Link to Contact” to associate a profile with a Contact. 7) To perform a manual search, you can type in the information about the contact into the “First Name”, “Last Name” and/or “Company” boxes and click on “Search”. 1) Click on the “Click here to setup your Twitter integration”. A box will appear asking you to authorize access to your account. 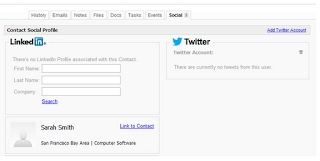 2) Click the “Add Twitter Account” link above the Twitter Feed Section. 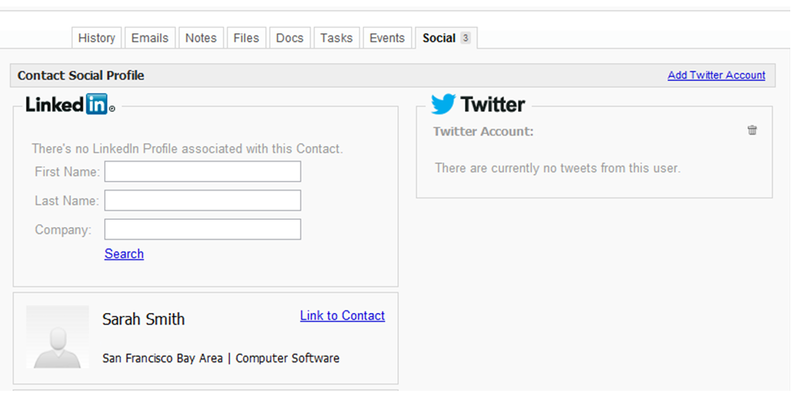 3) Type in the Twitter ID (Twitter/Screen Name) in the Text Box and Click Save. 4) You should now be able to see the Feed on the Social tab. 1) Navigate to 'My Info' > User Settings. The 'My Info' page is the small card icon in the top right corner of Insightly. 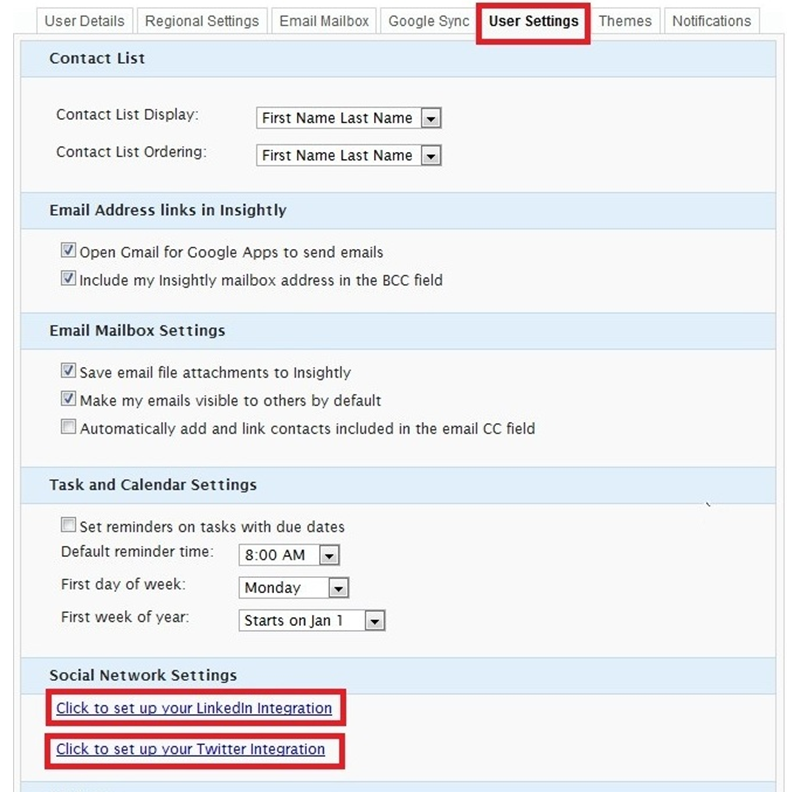 If your LinkedIn or Twitter integration is already setup, the links on the User Setting tab will allow you to remove the integration from Insightly, as shown below. You have the option to remove a LinkedIn or Twitter association from a Contact should you want to do so. To remove an association, all you have to do is to click the trash can icon within the Profile or the Feed.